^ a b c "1949-BULLETIN-10-WEB" (PDF). Retrieved 8 May 2017. ^ "European Free Trade Association by Shobicka Mehanathan on Prezi". Prezi.com. Retrieved 8 May 2017. ^ AFP in Reykjavik (12 March 2015). "Iceland drops EU membership bid: 'interests better served outside' union | World news". The Guardian. Retrieved 17 August 2016. ^ a b "Report for Selected Countries and Subjects". Imf.org. 14 September 2006. Retrieved 8 May 2017. ^ "Norway and the EU" (PDF). Eu-norway.org. Retrieved 8 May 2017. ^ a b "The Faroes and the EU - possibilities and challenges in a future relationship" (PDF). The Ministry of Foreign Affairs in the Faroes. 2010. p. 53. Archived from the original (PDF) on 23 August 2011. Retrieved 15 August 2013. 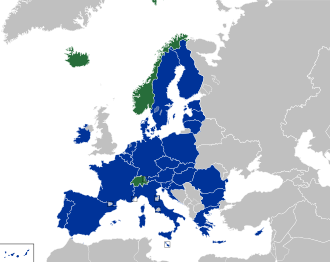 Under its constitutional status the Faroes cannot become an independent Contracting Party to the EEA Agreement due to the fact that the Faroes are not a state. ^ "Leaving the EU - RESEARCH PAPER 13/42" (PDF). House of Commons Library. 1 July 2013. Retrieved 19 May 2015. ^ "The Latest: Lithuania says UK must say if decision is final". CNBC. 27 June 2016. Archived from the original on 3 July 2016. Retrieved 18 September 2016 – via Associated Press. ^ Patrick Wintour (9 August 2016). "Norway may block UK return to European Free Trade Association | World news". The Guardian. Retrieved 17 August 2016. ^ "Sturgeon hints the Scottish Government could seek Norway-style EU relationship". 17 November 2016. Retrieved 17 November 2016. 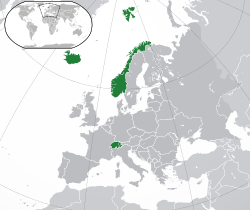 ^ "Iceland: Scotland could not start applying for EFTA until after independence". The Daily Telegraph. 16 March 2017. Retrieved 24 March 2017. ^ "EEA Agreement | European Free Trade Association". Efta.int. 1 January 1994. Retrieved 17 August 2016. ^ "AGREEMENT ON THE EUROPEAN ECONOMIC AREA". European Free Trade Association. 1 August 2016. Retrieved 8 May 2017. ^ a b c d "The Basic Features of the EEA Agreement | European Free Trade Association". Efta.int. Retrieved 8 May 2017. ^ "The requested document does not exist. - EUR-Lex". Eur-lex.europa.eu. Retrieved 8 May 2017. ^ "EUR-Lex - 21994A0103(41) - EN". Eur-lex.europa.eu. Retrieved 17 August 2016. ^ "Choose a language - Consilium". Consilium.europa.eu. Retrieved 17 August 2016. ^ a b "EUR-Lex - 32014D0954 - EN - EUR-Lex". Eur-lex.europa.eu. 30 December 2014. Retrieved 17 August 2016. ^ "Free Trade | European Free Trade Association". Efta.int. 16 September 2014. Retrieved 17 August 2016. ^ "Free Trade Map | European Free Trade Association". Efta.int. Retrieved 17 August 2016. ^ "Free Agreement". www.efta.int. Retrieved 3 February 2019. 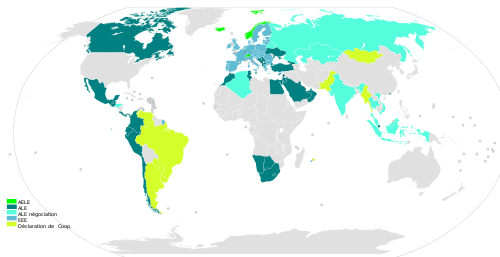 ^ "Free Trade Agreements | European Free Trade Association". Efta.int. Retrieved 17 August 2016. ^ a b "Joint Declarations on Cooperation | European Free Trade Association". Efta.int. Retrieved 17 August 2016. ^ "What is an EEA country? 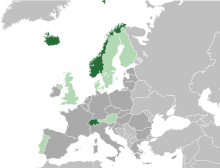 What is an EFTA country?". Livingingreece.gr. Retrieved 8 May 2017. ^ "All You Need to Know About Moving to Iceland – A guest post by Jenna Gottlieb". Iheartreykjavik.net. Retrieved 8 May 2017.